This model does not have any earpads. It has a 6' cord, and 3.5mm stereo plug. 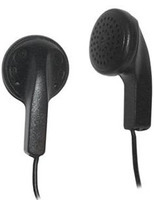 Small black earbuds with soft cushion earpads, a 6’ cord, and a 3.5mm stereo plug.